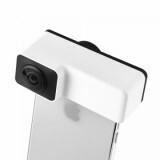 Panoramic Dual Lenses For iPhone, a brand new smart 360 Degree panoramic lens. 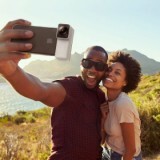 You just need plug in the panoramic camera, open the app to take a panoramic photo, and create a magical asteroid game with one click. Then you can share your pictures on Ins, Facebook etc. It can suit iPhone 6P/6SP, iPhone 6/6S, iPhone 7/8, iPhone 7P/8P, iPhone X.
Panoramic Dual Lenses For iPhone, which is a brand new smart 360 Degree panoramic lens, you can use it on your Iphone to enjoy a amazing world, this will be a wonderful experience you have never experienced before. 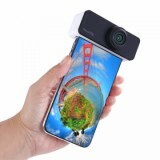 All you need to do is plug in the panoramic camera, open the app to take a panoramic photo, and create a magical asteroid game with one click. Then you can share your pictures on Ins, Facebook etc. It can suit iPhone 6P/6SP, iPhone 6/6S, iPhone 7/8, iPhone 7P/8P, iPhone X. The PanoClip APP has up to 30 panoramic filters and thousands of panoramic stickers. And can open thin face, big eyes, worn out and other beauty features. 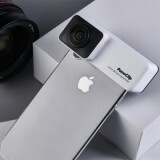 You can use it on traveling, party, concert and so on. What are you still waiting for? 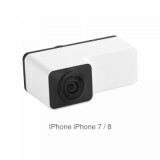 • SQ13, SQ23 mini camera are also available in BuyBest. Video quality is ok. Records 360 all around including top and bottom. Reason for lower rating is that the camera randomly locks up. Power switch doesn't even turn off device when locked up. Forced to hit reset button to unlock. Android software options are limited. You can not set default viewing mode. It constantly reverts back to a round video mode. Would be nice if you can set it to default to VR goggle mode since that's is whats it used for most. very good looking dash cam. 1080p recording video quality is prefect for a dash cam. i checked with the videos i recorede with this device. everything is clear. good to have this product. highly recommended for whoever may see this product review! High quality, it matches my iPhone 7 well and I take the len when out in travel. Portable, convenient and practical. Highly recommend this 360 degree len. Try to get familiar with it. At first it’s a bit difficult to get a nice shot but it’s good. Material of product is very good. Super fast delivery and material is great. Now I take photos with stabilizer, and this 360 Degree panoramic len, they work together amazingly. Easy to set up. It’s great! I see this kind of panoramic len in the Japan airport, it’s really expensive there. Thanks buybest for such nice quality product.